For a brief overview of the Encrypted Token Pattern, please refer to this post. The Encrypted Token Pattern is a defence mechanism against Cross Site Request Forgery (CSRF) attacks, and is an alternative to its sister-patterns; Synchroniser Token, and Double Submit Cookie. In the first instance, the need to ensure that requests originate from a trustworthy source is an obvious requirement. Essentially, we need to guarantee that any given request has originated not only from the user’s web-browser, but also from a non-malicious link, or connection. Why the Encrypted Token Pattern? Web browsers share state, in terms of cookies, across tabs. Imagine a user that is logged into mybank.com. They open a new tab in their internet browser and navigate to a website that contains a link to the above URI. An attacker that knows the user’s bank account number could potentially transfer any given sum from the user’s account to their own. Remember that the user is already logged in to mybank.com at this point, and have an established session on the web-server, if not a persistent cookie in their web-browser. The browser simply opens a new tab, leverages the user’s logged in credentials, and executes the HTTP request on the user’s behalf. Why uniquely identify the user? Consider that CSRF attacks can potentially originate from valid users. This time, John has supplied a valid token – his own (remember, John is also a valid user). Now, assuming that mybank.com does not validate the identity of the user in the supplied token, it will determine the request to have originated from a trusted source, and allow the transfer to take place. The Advanced Resilient Mode of Recognition (ARMOR) is a C# implementation of the Encrypted Token Pattern, available on GitHub under the MIT license that provides a means of protecting ASP.NET applications from CSRF attacks, by leveraging the Encrypted Token Pattern. The following steps describes a typical setup configuration. The ARMOR Web Framework is a set of components that leverage ARMOR itself, allowing developers to leverage the ARMOR framework in a plug-and-play fashion, without necessarily grappling with the underlying complexities of encryption and hashing. This tutorial focuses on leveraging the ARMOR Web Framework in C# to protect your ASP.NET applications from CSRF attacks. The hashing key that ARMOR will use to generate and validate hashes contained within ARMOR tokens. ARMOR implements hashes as a means of determining whether or not tokens have been tampered with, and to add an extended level of entropy to token metadata, rendering them more difficult to hijack. The time in milliseconds that ARMOR Tokens remain valid. These keys must be stored in the ArmorEncryptionKey and ArmorHashKey values in your configuration file, in Base64-format. The Authorization filter reads the ARMOR Token from the HttpRequest Header and validates it against the currently logged in user. Users can be authenticated in any fashion; ARMOR assumes that your user’s Claims are loaded into the current Thread at the point of validation. Generally speaking, it’s ideal that you refresh the incoming ARMOR token for every HTTP request, whether that request validates the Token or not; particularly for GET HTTP requests. Otherwise, the Token may expire unless the user issues a POST, PUT, or DELETE request within the Token’s lifetime. Both classes return an enumerated list of Claim objects consisting of a UserId Claim. In the case of MVC, the Claim is derived from the ASP.NET intrinsic Identity.Name property, assuming that the user is already authenticated. In the case of Web API, it is assumed that you leverage an instance of ClaimsIdentity as your default IPrincipal object, and that user metadata is stored in Claims held within that ClaimsIdentity. As Such, the WebApiIdentityReader simply extracts the UserId Claim. Both UserId and Timestamp Claims are the only default Claims in an ArmorToken and are loaded upon creation. If your application leverages a different authentication mechanism, you can simply derive from the default IdentityReader class with your own implementation and extract your logged in user’s metadata, injecting it into Claims necessary for ARMOR to manage. Here is the default Web API implementation. ARMOR downcasts the intrinsic HTTP IPrincipal.Identity object as an instance of ClaimsIdentity and extracts the UserId Claim. Deriving from the IdentityReader base class allows you to implement your own mechanism to build Claims. It’s worth noting that you can store many Claims as you like in an ARMOR Token. ARMOR will decrypt and deserialise your Claims so that they can be read on the return journey back to server from UI. Now that you’ve implemented the ARMOR WebFramework, each POST, PUT and DELETE request will persist a Rijndael-encrypted and SHA256-hashed ARMOR Token, which is validated by the server before each POST, PUT, or DELETE request decorated with the appropriate attribute is handled, and refreshed after each request completes. The simple UI components attach new ARMOR Tokens to outgoing requests and read ARMOR Tokens on incoming responses. ARMOR is designed to work seamlessly with your current authentication mechanism to protect your application from CSRF attacks. This entry was posted in ASP.NET, C#, CSRF, Security and tagged .net, ARMOR, ASP.NET, cross site request forgery, csharp, csrf, design patterns, double submit, double submit cookie, encrypted token pattern, hacking, owasp, security, stateless csrf, stateless csrf protection, synchronizer token on April 10, 2015 by Paul Mooney. Both approaches succeed in preventing CSRF attacks, while introducing architectural and security consequences. Below is a brief synopsis. While sessions generally cost a nominal amount of memory, significant user-load can exponentially increase that memory footprint. In general, it is best-practice to avoid sessions. More importantly, if a user has an active session on a specific web server, load-balancers will generally route that user’s subsequent requests to that specific server instead of distributing requests evenly. This results in over-utilization of that server and potential underutilization of adjacent servers. This feature can be disabled on load-balancers (generally), however doing so will result in associated sessions created on more than one web server for a specific user. This will cause synchronization issues, and require implementation of a session management tool to avoid loss of cached data across web servers. Cookies that contain sensitive server metadata, such as session cookies, should be tagged as HTTPONLY. This prevents client-side scripts from reading values from the cookie, adding a layer of protection. Given that this pattern requires client-side scripts to read the token from the cookie and apply it to the HTTP header, we cannot tag the cookie as HTTPONLY, introducing a potential security concern. Leveraging this pattern requires that all software in our suite of applications are fully XSS-resistant. If an application in a subdomain, below our application domain, is compromised within the context of an XSS attack, an attacker could potentially introduce a poisoned cookie to that site, which would be valid in our upper domain, and allow an attacker to circumnavigate our CSRF protection framework. Both methods of protection introduce design and potential security consequences. As a result, I’ve created a new pattern, the Encrypted Token Pattern, to address these concerns. The Encrypted Token Pattern is described here. 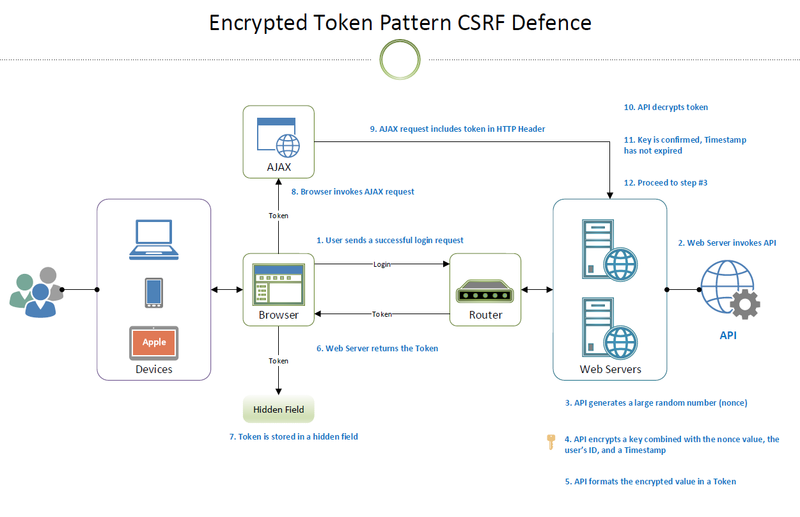 The Encrypted Token Pattern solves the shortfalls of other CSRF protection patterns and allows us greater control over CSRF-defense, without introducing new security concerns or architectural problems. Check out this post for a simple walkthrough outlining the steps involved in leveraging ARMOR to protect your application against CSRF attacks. This entry was posted in Security and tagged attack, csrf, double submit, double submit cookie, encrypted token pattern, hacking, owasp, security, stateless, stateless csrf, stateless csrf attack, stateless csrf protection, synchronizer token on September 23, 2013 by Paul Mooney.